Chicken. I have a freezer full of the stuff. It is perfect for when I am trying to watch my calorie intake. It can get a bit samey though so I am always looking for ways to keep the same old bits of chicken taste interesting without letting them anywhere near a deep fryer. Chicken breasts have their virtues but I more of a dark meat kind of a gal. 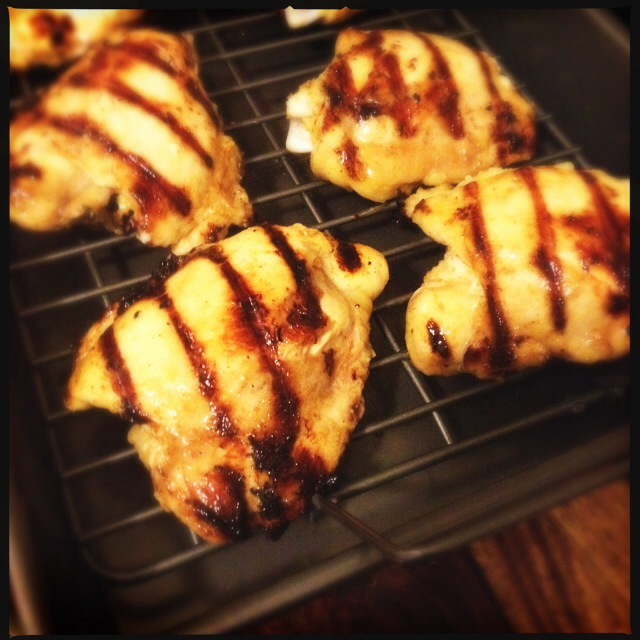 Chicken thighs have a succulence to them, even with their skin removed,that is more pleasing to my taste buds. Plus, they are pretty inexpensive and frequently on sale. Which was the case when I picked up these chicken thighs. Healthy and budget-friendly? Perfect! As bland as chicken parts can be, they can also be thought of as a great blank canvas that can be coaxed to take on a bunch of different flavors. Once I had the chicken thighs in my cart, I put my on my thinking cap to decide what I wanted to do with them. Eventually, I decided on a Mediterranean sort of vibe. 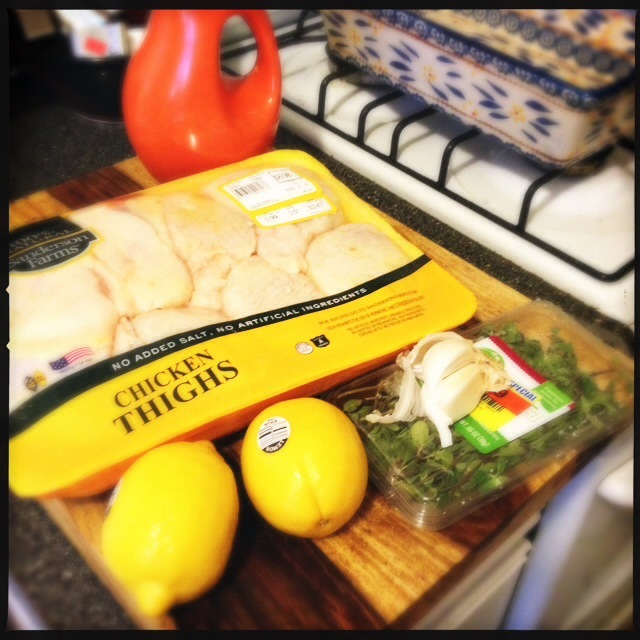 Lemons and garlic were the base for the chicken thigh recipe that was brewing in my head. Originally, I wanted to put a bit of fresh oregano into the mix but my supermarket didn’t have any. They did, however, have marjoram. Whilst not exactly the same taste, the two are fairly interchangeable. I put some in the basket and headed home to put together the chicken thighs in time to serve to Chris that night. It really was a super easy recipe. I just put all of the non-chicken ingredients into a dish to create a marinade. Then, I pulled the skin off of the chicken thighs coated them in the marinade. Then, they went into the fridge for an hour to soak up some of that lemony and garlic yumminess. After that hour, it just put the chicken thighs on the grill for a few minutes on each side. I used a cast iron grill pan. I love that thing. I am not sure my landlady does though because this was one of those comical after the fact moments where I was able to tell when it was time to take them off the grill pan by when my smoke detector went off. Not because anything was burnt but because the ventilation in my apartment’s kitchen stinks. The sort of steam that comes off that grill pan when it is up high was enough to send me scrambling to find a broom so that I could reach the off button of the smoke detector. After they came off the grill pan, I put the chicken thighs into a roaster pan and then into the oven for another 15 minutes or so to get them cooked through. These chicken thighs were packed with so much flavor that I had to stop myself from picking at them before it was time to take them to the table. The garlic had my taste buds tingling and then that citrus came in with a refreshing zing. So good and healthy too! 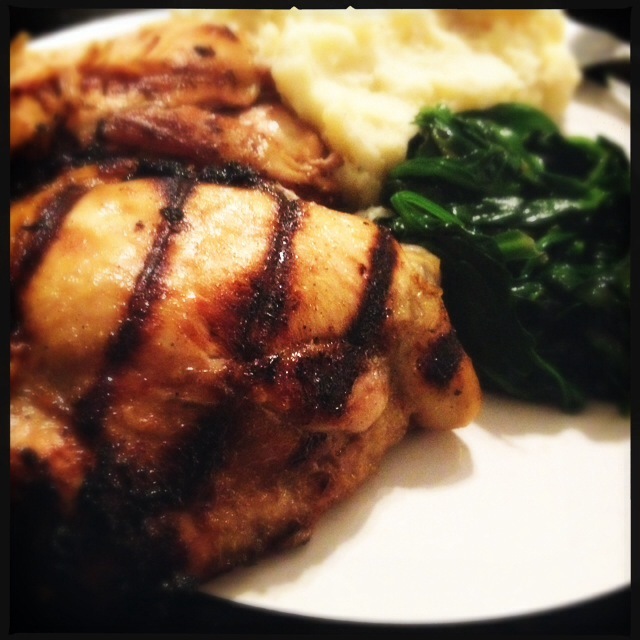 I served them some sauteed spinach and some mashed potatoes to form a killer low fat chicken thighs meal. I put together a video to prove that it really is that easy. Next time, I will hold the camera the right way around. LOL. Combine olive oil, lemon juice, lemon zest, garlic and marjoram or oregano in a dish large enough to hold all of the chicken thighs. You could probably do it in a big Ziploc bag, I just didn’t think far enough ahead to have one in the house. Once everything is combined, put the chicken thighs in the dish and coat with the marinade. With that done, put the dish into the fridge for at least an hour. To make your work night meals as easy as possible, you could put them together in the morning and have them ready to cook when you get home. When you are ready to cook, preheat the oven to 475 and put a grill pan onto the heat. You could use a cast iron skillet if you don’t have a grill pan. You just won’t get those nifty grill marks. 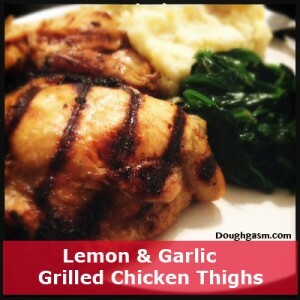 Put the thighs on the hot grill pan, the marinade will act as all the oil you need. Cook them for about 7 minutes each side. 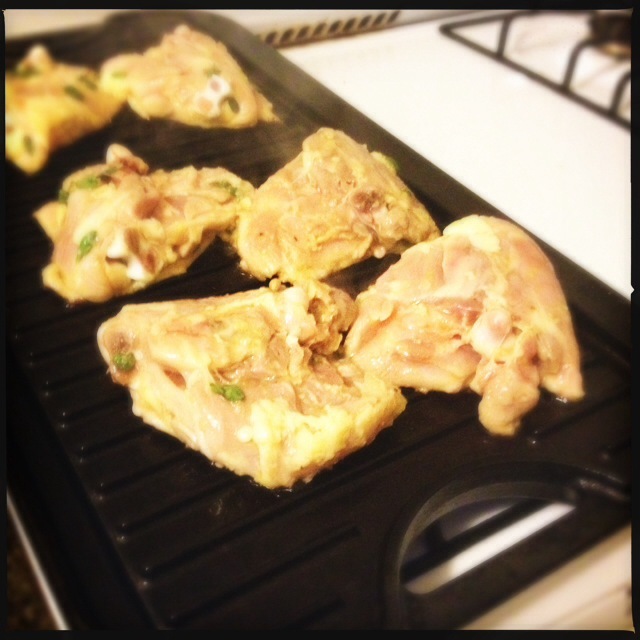 Transfer the chicken thighs to a roasting pan and put the pan into the preheated oven. Cook for another 15 minutes or until cooked through. Rest for five minutes and then serve. 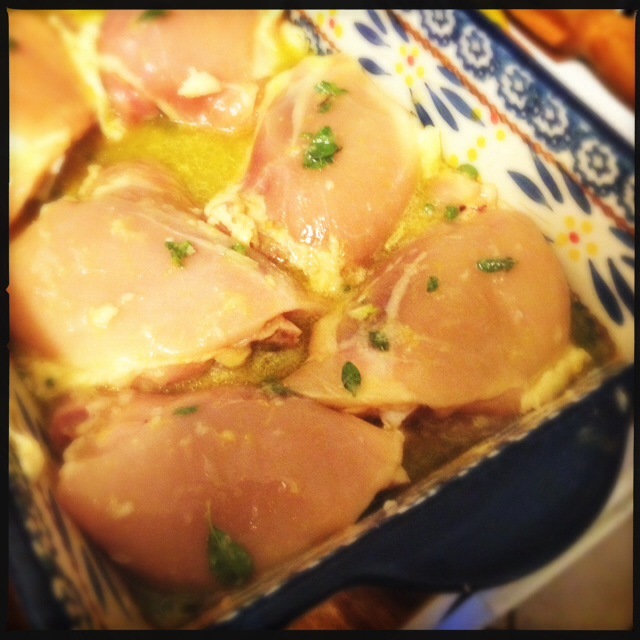 This entry was posted in Home Cooking and tagged Chicken. Bookmark the permalink.